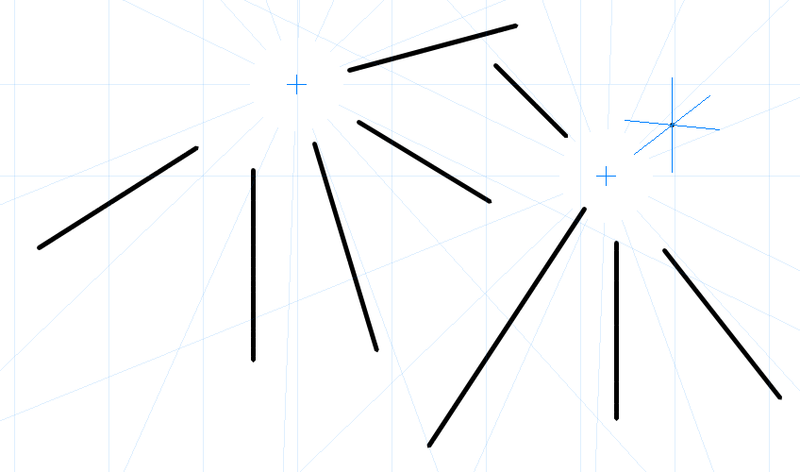 These Vanishing Points guides are divided into three parts : 1 point, 2 points and 3 points. 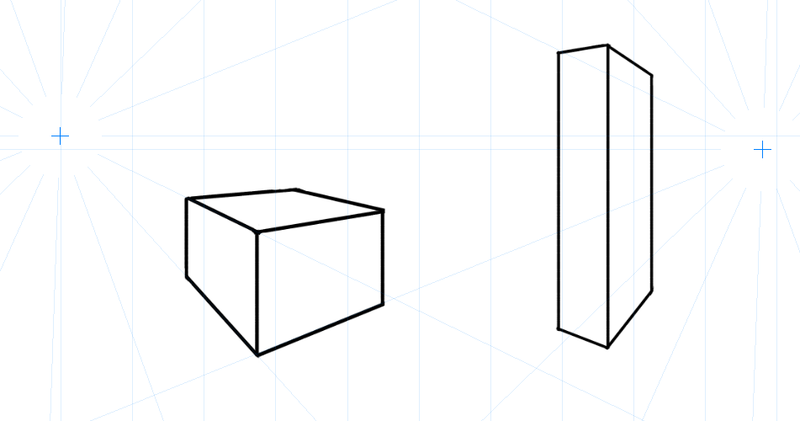 They will allow you to draw straight lines in perspective to form cubes and other geometric shapes. These tools will help you to build your backgrounds and have the good perspective. A small blue square indicates the position of the cursor. 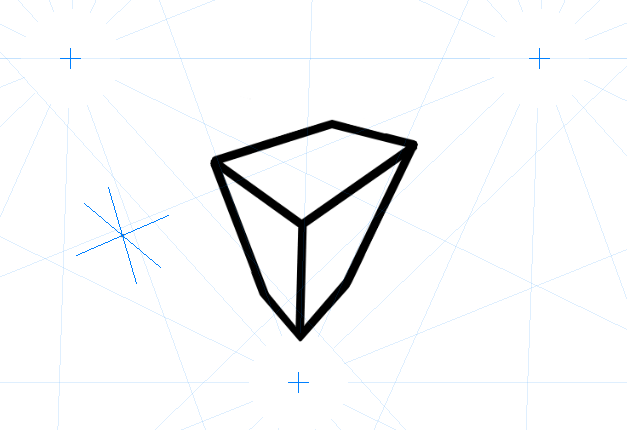 Click on the drawing area, a (blue by default) virtual cross appears at the chosen location. The Vanishing Point 1 is now created. 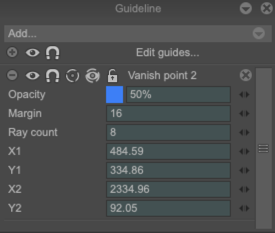 As for the other guides, the first options (Eye, Snap, Transparency, Margin ) have the same utility and parameters. 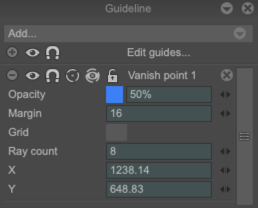 All of the interest of this Vanishing Point guide is in the Assist tool. We advise you to keep this option activated. A small virtual line appears on your cursor. You will not be able to deviate from this Assist guide. With the Assist tool, you will be able to draw perflectly straight lines, in the perspective of the virtual Vanishing Point you have created. X and Y inform you about the position of your Vanishing Point 1 guide. It is possible to change this parameter with the mini-elevator on the right or with the numeric field. You can also use the Edit button. You will be able to access the little blue square once again to manually modify your Vanishing Point guide. You can obviously add as many Vanishing Point 1 guides as you wish, but that's also the interest of the two other Vanishing Points guide. This guide will allow you to place 2 Vanishing Points. A small square will indicate you the position of the cursor. Click a first time in the drawing area, and a virtual cross (in blue by default) will appear. The cursor is still accompanied by the small square to allow you to select another location in the workspace. Click again, the Vanishing Point 2 is then created. With the Assist tool, you will be able to draw perflectly straight lines, in the perspective of the two virtual Vanishing Point you have created, to make more elaborate constructions. X1, X2 and Y1, Y2 inform you about the position of your Vanishing Points 2 guides. It is possible to change these parameters with the mini-elevator on the right or with the numeric field. You can also use the Edit button. 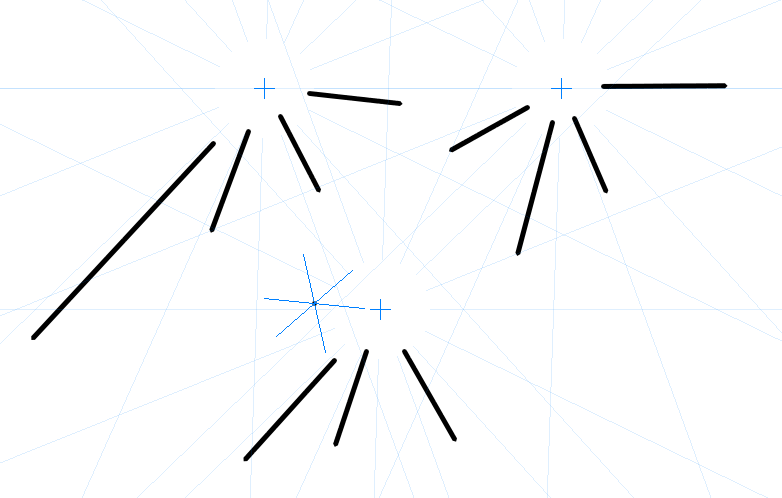 You will be able to access the little blue square once again to manually modify your Vanishing Point 2 guide. You can obviously add as many Vanishing Point 2 guides as you wish, but that's also the interest of the third Vanishing Points guide. This guide will allow you to place 3 Vanishing Points. A small square will indicate you the position of the cursor. 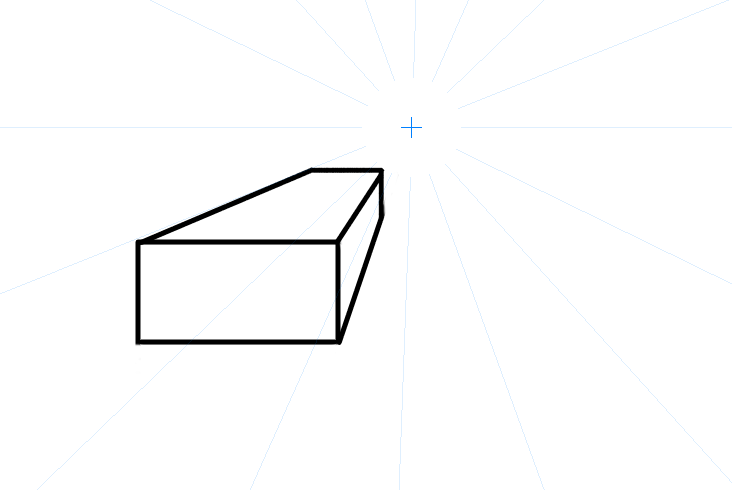 Click a first time in the drawing area, and a virtual cross (in blue by default) will appear. The cursor is still accompanied by the small square to allow you to select another location in the workspace, which allows you to choose a second point in the workspace. 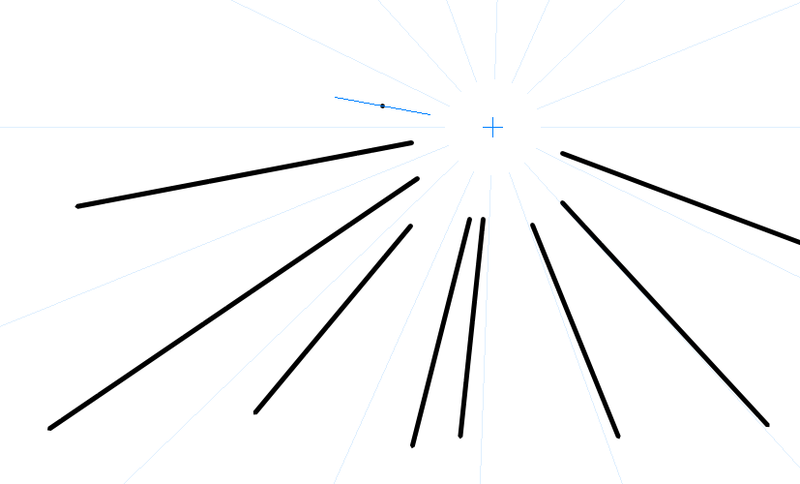 Click again, the square-cursor is ready for the third Vanishing Point. Click one last time, the Vanishing Point 3 is created. With the Assist tool, you will be able to draw perflectly straight lines, in the perspective of the three virtual Vanishing Point you have created, to make even more elaborate constructions. X1, X2, X3 and Y1, Y2, Y3 inform you about the position of your Vanishing Points 3 guides. It is possible to change these parameters with the mini-elevator on the right or with the numeric field. You can also use the Edit button. 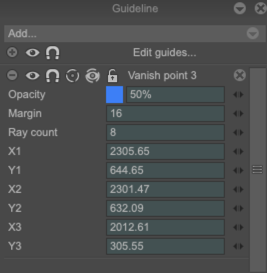 You will be able to access the little blue square once again to manually modify your Vanishing Point 3 guide.